THE PIGEON TUNNEL: STORIES FROM MY LIFE. By John le Carre. Read by the author. Penguin Audio. 10 CDs; 11 ½ hours. $40. Also available in hardcover from Viking. Imagine that you could visit John le Carre, the highly successful author of British spy novels, who will turn 85 in a couple of months. Imagine that you could sit with him in London, or at his retreat in Cornwall, lingering over dinner and good wine, and listen to him reminisce. Always charming and courteous, he would tell you stories about an incredibly rich life, filled with adventures, fascinating people, humor, thoughtfulness and creativity. Few of us can have that enviable experience, but le Carre offers the next best thing to anyone who wants to devote a few hours to listening. He has written The Pigeon Tunnel, a memoir of sorts – stories from his life – and he reads the audio version himself. Le Carre, whose real name is David Cornwell, worked in British intelligence during the Cold War for a few years, serving mostly in Germany. He wrote his first spy novel in 1961, while he was still serving. In 1964, when he was in his early 30s, he left the service, and he has been supporting himself handsomely as an author for half a century now. He goes out of his way to assert that he is in no way a great spy who turned to writing, but rather a writer who spent a few years early in life as a largely inconsequential minor figure in the intelligence establishment. From his secret service, he seems to have gleaned an understanding of how things work and don’t work more than any deep, momentous secrets. Anyone who has read some of his books should delight in listening to these stories, written with the same intelligence, sensitivity and willingness to confront moral and ethical ambiguities that distinguish his novels. Although he has been extraordinarily successful, earning critical acclaim and commercial success from books and many movie and television adaptations, le Carre comes across as modest, self-deprecating, often bemused and sometimes amused by the turns his life has taken. Modest or not, he has many great stories to tell, and he tells them well. Early on, he drew inspiration from his experiences, supplemented with research, to write his novels. But, he tells us, a traumatic experience when he had to make last-minute revisions to his novel Tinker, Tailor, Soldier, Spy because he arrived in Hong Kong to discover, to his horror, that “somebody had built a tunnel under the sea between the island of Hong Kong and the mainland of Kowloon without my knowledge,” he traveled considerably more for research. After that, he ventured into such interesting and sometimes dangerous places as Vietnam, Cambodia, Israel, Russia, Central America and Africa, in quest of experiences. That is how, for example, he came to spend one unforgettable New Year’s Eve dancing with Yasser Arafat. There are stories, too, about his dealings with movie stars and producers and the vagaries of Hollywood moviemaking. He became, for a time, essential to the well-being of Richard Burton during the making of the 1965 movie of The Spy Who Came in From the Cold, and he has some amusing stories to tell about Burton and his then new bride, Elizabeth Taylor. He and Alec Guinness, who memorably played le Carre’s most famous character, George Smiley, became great friends. Le Carre even has an amusing section in which he recounts various movie deals that never came to fruition. Occasionally, le Carre talks about recent political developments, and he does not mince words when he mentions, for example, the United States’ activities at Guantanamo. But this is not for the most part a political book. He is careful to suggest that in most cases, politicians and spies base their actions on what’s known or believed at the time, and it is not easy to say what he would have done in a similar situation. Among the most moving parts of the book, and obviously one that was challenging for him to write, are le Carre’s thoughts about his parents – his mother, Olive, who deserted him and his older brother when they were young children, and especially his father, Ronnie, con man extraordinaire who had a profound impact on everyone in his orbit, including his son David, aka John le Carre, who drew on Ronnie for his novel A Perfect Spy. Le Carre writes about his father’s flaws and failings, but he also suggests that he has plenty of his own. Perhaps best of all are le Carre’s musings about memory and imagination, and the passages where he links the stories he’s telling to characters and events that made their way into his novels. These glimpses into a writing life are fascinating. No one could have read this book better than le Carre himself. At one point, he talks about what others have told him about his mother’s gift for imitating voices and notes that he, too, has an “ear for voices.” Often, he tells a particular story through dialogue, remembered and possibly enhanced by memory. He does a marvelous job with the voices. What a fine gift John le Carre has given to his legions of fans. Make some time, get comfortable, and listen to stories from a master. 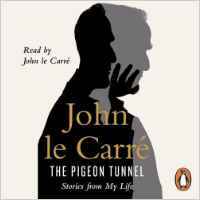 This entry was posted in Audio Books, memoir and tagged Audio Books, John le Carre, The Pigeon Tunnel. Bookmark the permalink.